Conforms to National and International Standards including ASTM D7091/B499, ISO 2808 and others. PosiPen has a very small, unique magnet which can be placed with pin-point accuracy on extemely small parts and on peaks and valleys. Measures non-magnetic coatings such as paint, enamel, plating, hot-dip galvanizing on steel. 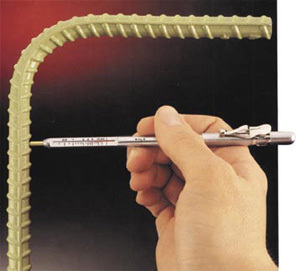 Place the tip of the PosiPen on the coated surface and allow the magnet to contact. Pull the PosiPen straight from the object to be measured while keeping close watch on the appropriate indicator. Note the reading when the magnet releases. Use the red/silver joining line when the Gage is horizontal (walls). Use the green line when the Gage is pointing straight down (green/ground). Use the blue line when the Gage is pointing straight up (blue/sky).